The biggest PARA Tech FAIR of Holland! +20 stand, free readings, tech-healing sessions, special sinbox, free wifi, algorithmic predictions, digital dharma, unlimited mantras, datamindfulenes, super situated suerstition by 26 tech-nosts & technopagans. Enrich + Balance your ON AND OFFLINE life-lines. What is occult for the eye is not occult for the mind. Chakras function like receivers on different wave-lenghts. Get paranormal in the Avantgardistic State. Contributing artists: Roos Groothuizen, Derk Over, Mary Ponemoreva, Steffi Luchtenburg, Anastasia Kubrak, Ruben Baart, Next Nature, Stëfan Schäfer and Dr. Emily West, Pinar & Viola, Chronicles of Solemon, Jakob Schlötter, Willem Stapel, Paul Boelens, Gui Machiavelli, Elsemarijn Bruys, Isa van Weert, Floris van Driel, Loui Meeuwissen, Unicore + Mona Lisas, Vicky de Visser, Loes Claessens, Ymer Marinus, Cyanne van den Houten and TELEMAGIC. Live on air in 300 metres pirate-radio by TELE.FM (EMP.FM). 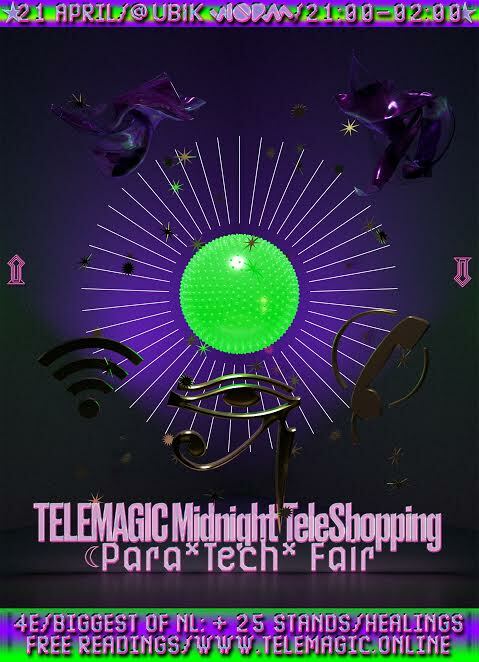 PARA ABNORMAL Tech FAIR with products and prototypes for objects, services and interfaces to stimulate a discourse of behavior and consciousness in Cyberspace. From Smart-homes systems for long distance relationships to prophetic predictions on your online behavior. $UPER $EXY Nightshop sells products to strengthen the relation of the lifecycle of the human by TECH like a manual for digital death + sextoys for the new sexual revolution. $ENSUAL HEALING! The Oracle pulses, breathes, predicts and generates THE future. Like occult technologies, the oracle processed groupthink as poetry, converting nonsense into sense. The Oracle reflects upon your data realm.